Yvonne on a cliffside trail in Ucluelet. I took a spring trip to the west coast of Vancouver Island with my friend Yvonne Maximchuk. It was partly for work with lots of time for play. Yvonne is an author and artist. 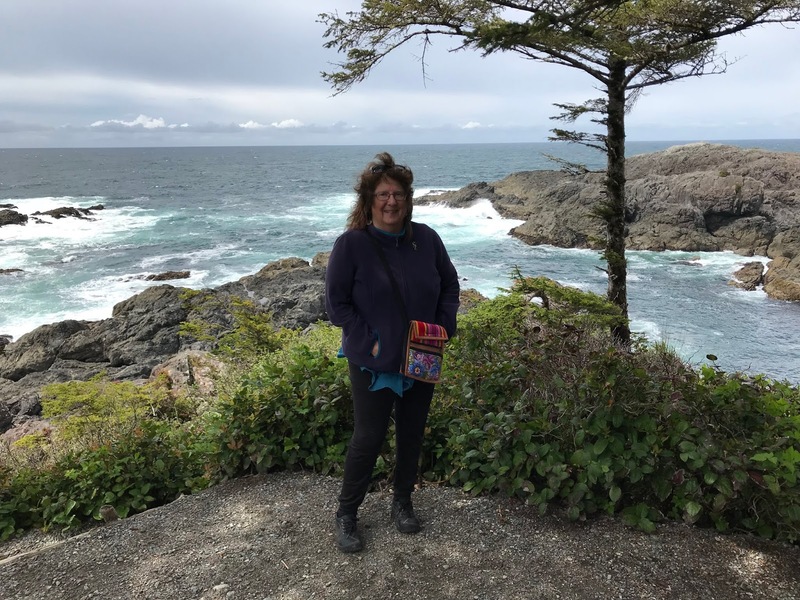 She needed to drive to several galleries to pick up paintings that were on display and take them to the Filberg Lodge in Comox for a show on Mother's Day weekend. 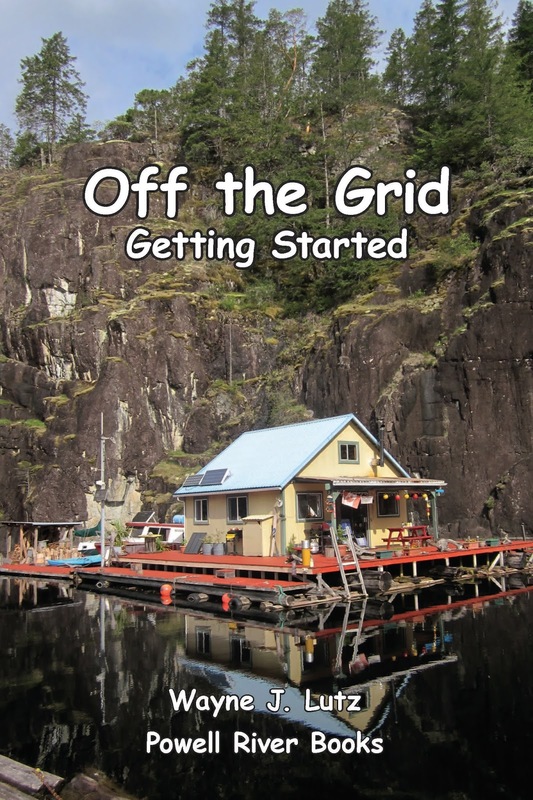 We stopped in Port Alberni and purchased lunch makings to use for hikes and beach visits. 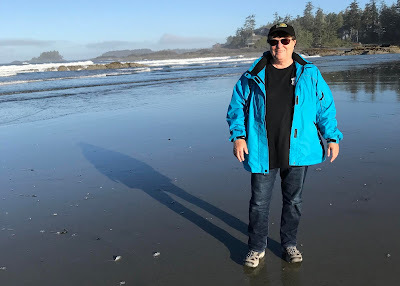 Our first stop was Long Beach in the Pacific Rim National Park. It wasn't a sunny day, but still the long hard packed sandy beach was beautiful. 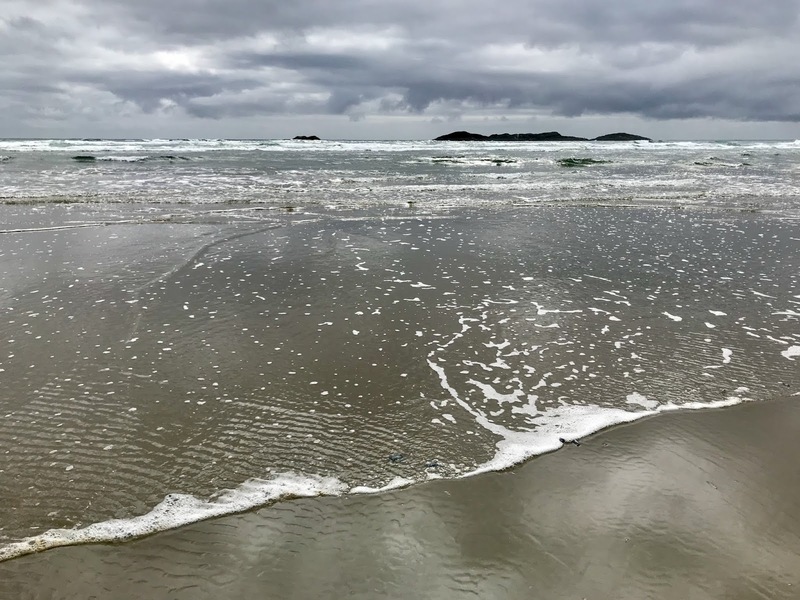 Long Beach in the Pacific Rim National Park Reserve. We were surprised to see hundreds of thousands stranded Velella Velellas (By-the-Wind-Sailors). Some were fresh and others had already reduced to their chitonous structure. 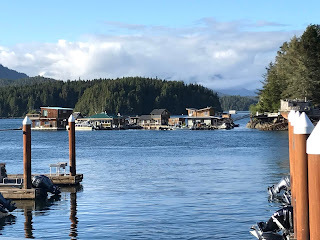 We spent two nights in Tofino at the Tofino Resort and Marina. 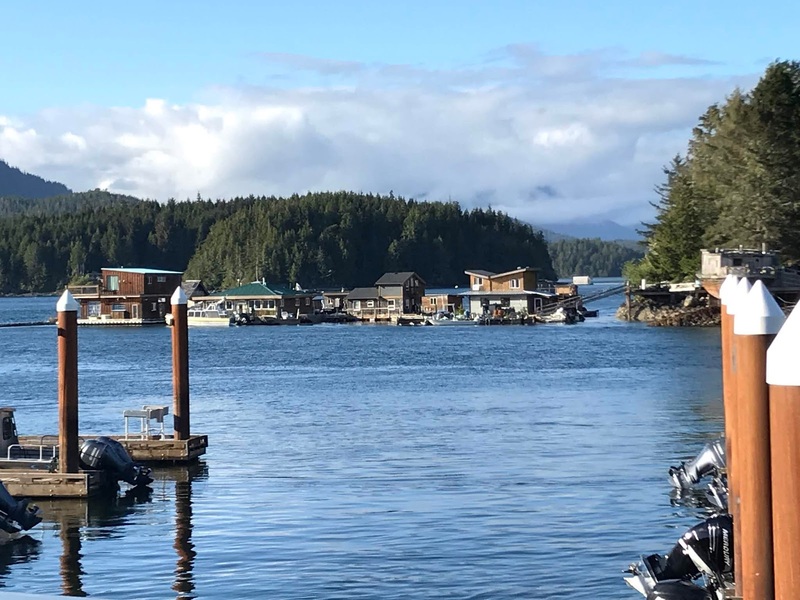 It's totally remodeled and has a wonderful restaurant and pub down by the marina. I enjoyed the view of floating homes across the bay. We had a queen suite with two separate rooms, one with a comfortable sofa bed. The large deck was where we spent our evenings with glasses of wine and snacks before and after dinner. 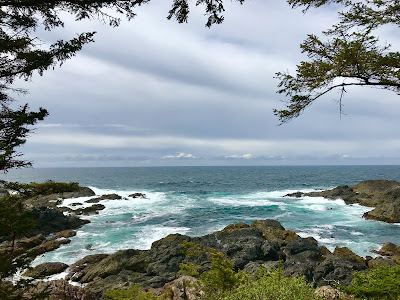 The second day we went to Ucluelet to a gallery to pick up paintings. While there, we walked a portion of the Wild Pacific Trail. There were magnificent views of the rugged coastline. A trip to Tofino wouldn't be complete without a visit to Chesterman Beach to watch cold water west coast surfers. 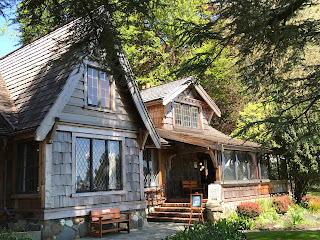 The trip ended in Courtenay so I could help Yvonne set up for her art show and sale at the Filberg Lodge in Comox the next day. The historic lodge made their wall available to display her art for visitors throughout the weekend. The lodge was the home of Robert and Florence Filberg. 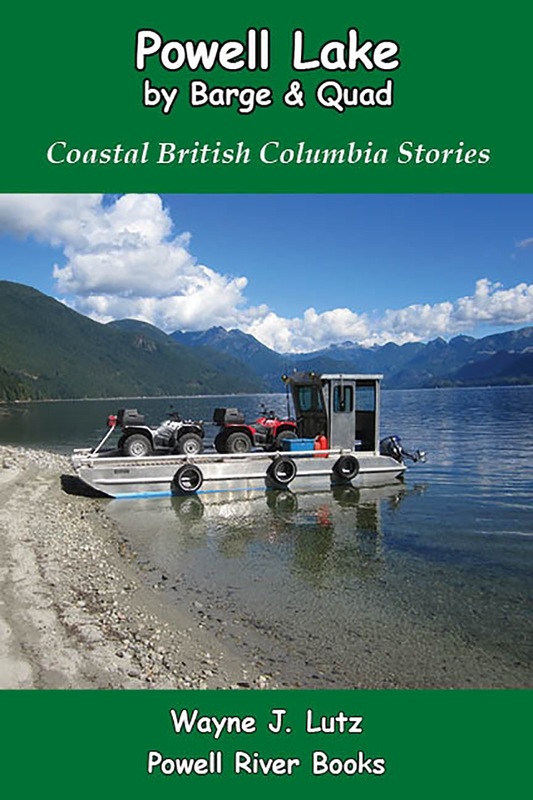 Robert was Superintendent of the Comox Logging and Railway Company and the home is beautifully positioned on the bay. 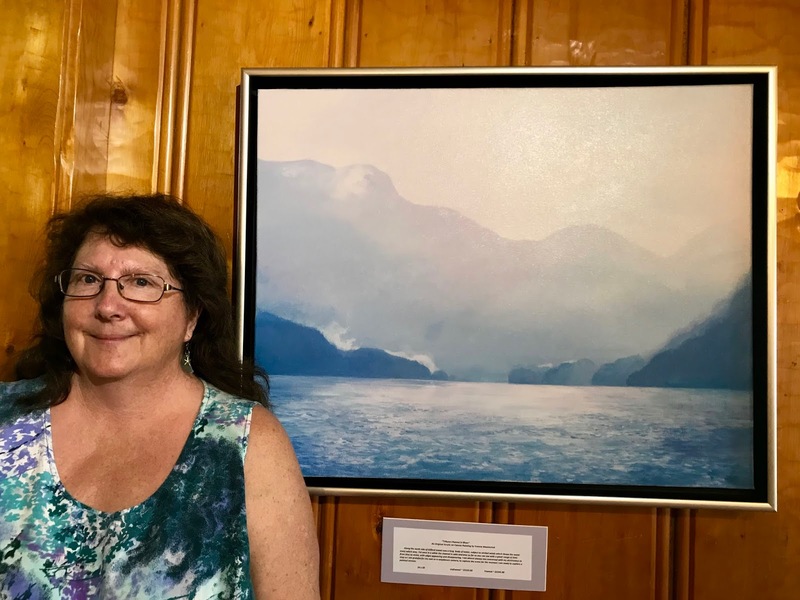 Yvonne with a painting at the Filberg Lodge. Here's Yvonne with one of her paintings inside the magnificent lodge. Outdoors there are gorgeous gardens with lots of flowers, shrubs and trees. The grounds and lodge are open to the public and very popular with locals and visitors alike. 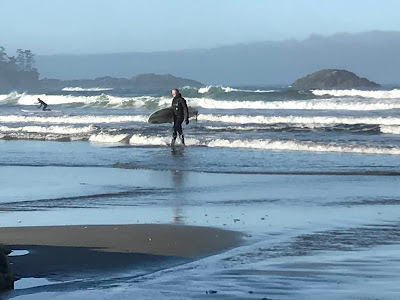 Come visit Vancouver Island and be sure to put Comox, Ucluelet and Tofino on your travel list. Oh, Margy, how absolutely wonderful! It's a good thing that jealousy is unbecoming to a lady, so the worst I can be is envious! 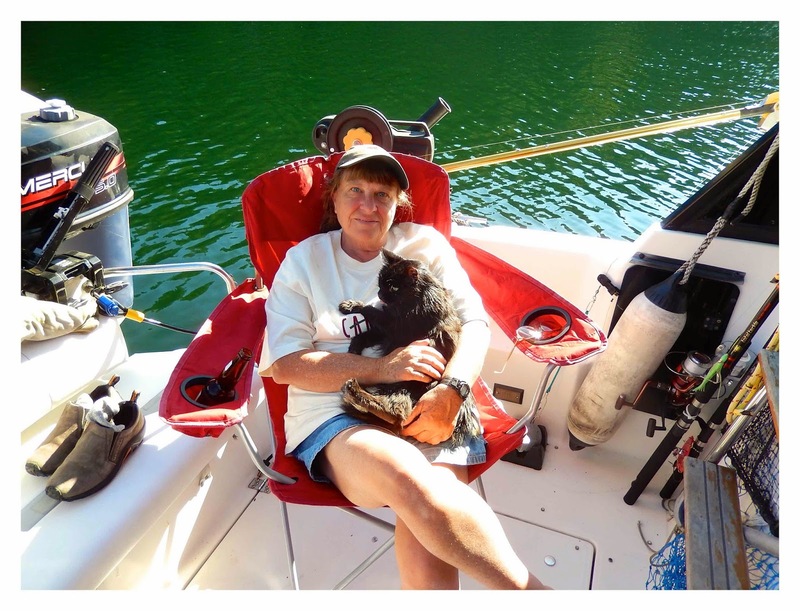 I'd give my eye teeth to do that trip, but I have dentures, so that rules out another option! I'd love to see Yvonne's work. I've heard of her, of course, as have a great many British Columbians. Thanks for sharing your fabulous photos with everyone in Our World! Am I right in expecting to see some of her work (perhaps) in your next blog post? Thanks for sharing your trip to one of the most beautiful places in the world. Your trip sounded fun and delightful. Looking at your photos made me feel like I was there. Thanks! How wonderful you did get the opportunity to hike along on that trip... not only for yourself but also for us to share so magnificent sights. Oh so beautiful ~ what a place ~ lovely pictures! What a wonderful road trip and a lovely lodge for Yvonne's art show. Thanks for sharing! It looks rugged and beautiful. Brrr. Surfing. Interesting stuff, Margy. 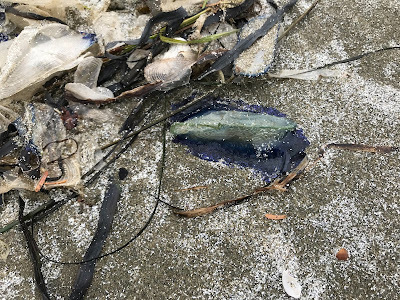 I had never heard of Veella Velella before and had to look it up. Again very interesting. You have made a real friend in Yvonne. Margy - loved the fifth shot. Gorgeous little cove. How cool to accompany your friend on such a special trip - so glad to see women artists get their time in the sun. Thanks for sharing this great trip! I love Yvonne’s painting.